When a sinister creature murders one of the conquerors’ soldiers, Brohr’s violent reputation makes him the prime suspect. Haunted by a rage-filled ghost, Brohr’s disturbing possessions quickly become the reason for all of his troubles…and the only way he can survive. With a grandfather bent on dragging him into a failed rebellion, and a deadly comet hurtling toward his embattled world, Brohr sets off on a quest to save his people and uncover the truth about a war stretching back into the ancient past. 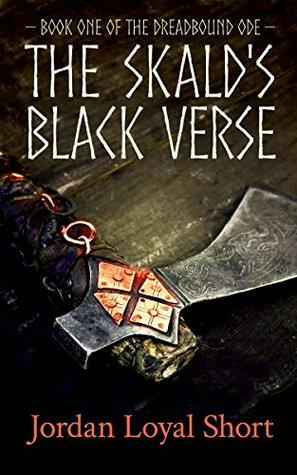 Can he discover the true power of a Skald’s voice before the world itself ends in ash and flame? This is an incredibly dark fantasy novel, rippling with violent magic and political malevolence. Short is an excellent builder of worlds; the detail on Skolja’s past was intricate and encompassing. Their religion, their servitude, their closeted family secrets. All were very carefully placed and explained by Short, ensuring a well developed and intriguing world for us to find ourselves in. It’s clear he’s taken pains with it; his love shines through every single meticulous detail. The plot itself is confusing to begin with, and it isn’t until around halfway through the story that we begin to find our path. This isn’t a bad thing as such; the initial chaos and confusion lend themselves to the characters’ own panics, and allow us time to understand motive and setting. I did feel, however, once the real journey had begun, the tension and twists began to ebb, and the momentum fell away for me slightly. Short’s writing is clean and raw, and he particularly impressed me during the action sequences. I also enjoyed the quotes from (fictional) historic or religious texts at the beginning of each chapter. It helped again to build this world and understand the characters’ ways of thinking. Character background and development felt a bit lacking (I would’ve liked more of Lyssa’s past to be communicated), but as the first book in a series, I imagine there is much more to come. I truly hope Short will rise above the mundane and avoid any romantic scenes in the sequel. I can predict great things for the rest of this series; if an author is willing to kill a dog (much to my disgust, I should add), he is willing to do anything.